How did I get this fungal toenail / fungal infection ? How did I get this fungal toenail / fungal infection? Does your salon use an Autoclave? Fungi are tiny micro-organisms, a bit like bacteria but from a different family. Normally, the nail is protected from infection by these bugs by a protective layer that covers the surface of the fingernails and toenails. Fungal toenail infection gets in when the nail surface is damaged, creating a portal of entry for these organisms. How might you damage a nail to let fungal toenail infection in? It is easy to abrade the surface of the nail enough to allow entry to fungal spores. Perhaps the nail was scuffed up by a close fitting shoe, gouged while you were using a nail tool or damaged by any kind of trauma. Events that cause a blood blister to form or the nail to lift at all would be especially suspicious. Leaving nail polish on for extended periods is also an excellent way to develop the infection as it can ‘paint’ the fungus into place instead of falling off the shiny nail surface. Nail polish also traps moisture within the nail and in the skin below the nail so that it takes hours to properly evaporate. This body heat, moisture and darkness creates perfect breeding conditions for the bugs. You should be particularly wary about communal nail polish pots such as you might find in pedicure salons. Here, you may well pick up fungal spores from the person before you. After all, who better to want their nails polished than someone with unsightly fungal toenail infection that they want to hide? Of all of the cleaning methods that you might think a nail salon would use, only an autoclave will kill fungal spores. These sterilisers cost up to $10 000. All podiatrists are obliged to autoclave nail tools between uses but nail salons are not covered by this sort of legislation in Australia. Consider then whether the local pedicurist has invested in one of these expensive devices. Some do – particularly as legislation does require salons who do cosmetic tatooing and piercings to have their tools sterilised between uses. It is well within your rights to ask questions about how the salon cleans their tools and environment between customers before you try them out. 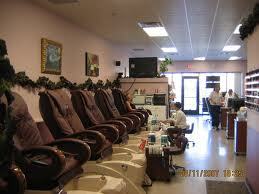 As podiatrists, we see hundreds of people per year damaged by nail salons. Each one will take up to a year of podiatric treatment to restore to proper nail health. For more fungal toenail information, see our printable Fungal Nail Info Sheet or information about Pinpointe fungal nail laser. Use this link to return to the Podiatry FAQs Blog.